It makes me a little crazy when people talk about doing a “Bible study” and then mention the book they bought to do the study, which may or may not even have them opening up the Scriptures. Sometimes the study they are doing is simply character development using Scriptural principles with scattered verses in it. Friends, Bible Study is digging into God’s word to see what He has to say. The Bible is a treasure trove of wisdom, God’s love letter to His church. Take time to see what it is that He is saying to you! I once heard that the speed in which we move determines the kind of details we notice. If you fly over someplace on an airplane, you will see buildings and landscaping. Driving by in a car, you will see people and some details on buildings and trees and bushes. If you ride a bicycle, then you will perhaps notice even more details, but it isn’t until you slow to a walk that you can truly appreciate the fine details of the things you are passing by. I think the same holds true of the books we read. If you are reading the story, you are going through a paragraph at a time, if you will. 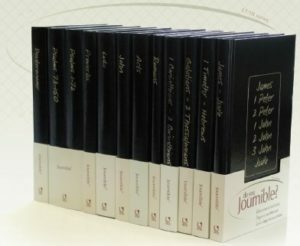 The Journible brings you to a word-by-word pace through the Bible. I found that as I was copying the verses, I repeated each word and phrase in my head multiple times, causing me to pay more attention to the message. I first read it, then I repeated it to myself as I wrote, and then I reread to confirm I copied it correctly, etc. The Journible is a great tool for meditating on God’s word. Here are some of my impressions of the book itself. The Bible text is not in the book, so you need to have one to copy from. This does give you the freedom to choose your translation. I thought that I would be able to do this from my recliner, and I kinda made it work by using my tablet for the text, but it is probably best to do this at a table where you can spread out. Overall, I really like the idea of this as an heirloom to be passed on from parent or grandparent to their (grand) children. The look is elegant and could become a treasured possession. I know I greatly appreciate my aunt’s Bible with her notes. I do have a hard time seeing myself using this as a study aide going forward once I have the Scripture copied here. 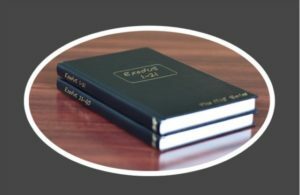 As careful as I am, my writing is just not that fantastic and combined with my struggling to keep the book open as I wrote, it would be better for me to use a complete set of Scriptures for regular reading and study. Regardless of the tool you use, I strongly suggest picking a book of the Bible and writing out your own copy of it to experience the beautiful details of God’s word in a rich, new way. This is the BEST review I’ve read on this tour! Thank you for mentioning how the books do not lay open well and that the verse numbers are hidden in the margin. I hadn’t given any thought to using the book after I had copied all of the scriptures. However, the simple act of copying would be a great exercise, like you mentioned. Thank you so much, Amanda! I’m so glad the review was useful to you.